Meaning: Vira-Hero, Warrior, courageous and vigorous, Bhadra-Friend, good, auspicious. Asana-Pose. Virabhadrasana is a mythological character created by Lord Shiva, a Hindu God. This pose honours the feats of this legendary warrior, honouring the spiritual warrior within doing battle with the universal enemy, self ignorance which is the source of our suffering. This is a graceful, standing pose and the first in a sequence of three Warrior Poses with a further two less known Warrior Poses. This asana looks deceptively easy but is extremely challenging. Strengthens and tones the the lower back, the arms, legs and core and helps to stabilise and balance the body. Increases stamina and stimulates the metabolism. Improves the strength and flexibility of the hips and knees. This asana helps ease frozen shoulder and releases stress from the shoulders. As the chest expands, the lungs open and brings energy. Relaxes the mind and the body and imparts a sense of courage and grace. 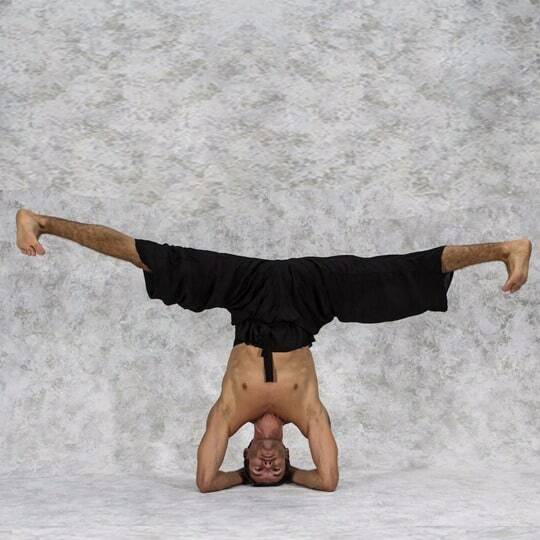 Standing in the middle of your mat facing sideways with very slightly bended knees and legs about 3-4 feet apart. Lift your right foot to balance on the heel and then rotating from your upper thigh, turn your right foot outward 90 degrees to the right and your left foot slightly inward about 15 degrees. Align the right heel with the arch of the left foot and turn your torso to the right with the right hip back and the left hip forwards. If you feel any discomfort in your left knee relax your left hip back a little. If you feel slightly off balance step your right foot to the right slightly to widen your stance. Ground into the left heel and keep the left leg strong and straight. Raise your arms sideways parallel to each other and in line with your ears, palms upwards. Reach for the sky at the same time as drawing your shoulder blades down and firming them against your back. If your shoulders feel tight, slightly widen your arms. Make sure the left heel is grounded firmly into the mat, exhale and bend your right knee over the right ankle so that the shin is perpendicular to the floor. Keeping the bent knee directly over the ankle, point it towards the centre of your right foot which will prevent the knee collapsing inwards. Turn your gaze to the right. If you experience a problem with the back foot lifting, you may place a block below your heel, to help you stabilise you can also press your heel against the wall. Press the outer left heel and side of your foot firmly to the floor to strengthen the left leg. Tilt the pelvis slightly forwards and compress the lower back. To counteract an overarch of the rib cage away from the pelvis, lengthen the tailbone downwards and tilt the pelvis slightly upward. 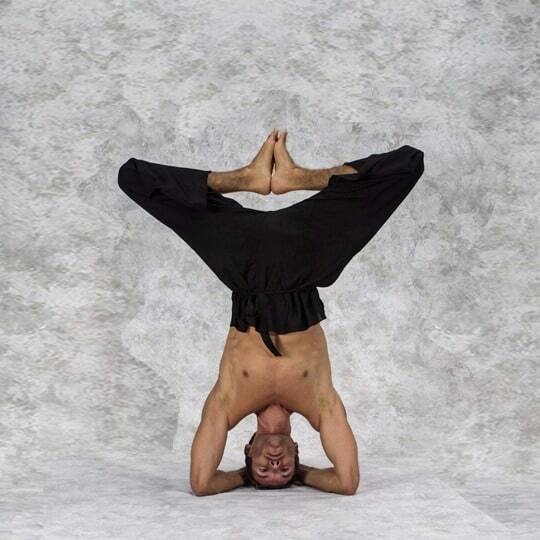 Maintain the pose by pressing strongly through both feet. Reach through the arms, lifting your rib cage and engage your core muscles. Stretch your arms further and join your palms above your head. Look at your palms. If you are unable to do this or have shoulder pain, raise your arms and leave them parallel to each other instead of above the head. If you have neck problems do not look up at your hands. Hold the pose with the same determination as a warrior. Breathe normally and continue going down, inhale and come up. Exhale and gently lower your hands. Return to your starting position and repeat the pose on the left side. High or low blood pressure. Heart problems. Shoulder and neck problems can be addressed as described above. Injury to the knees or the hips can make this pose difficult. If there are issues relating to headaches or balance, go slowly and practise with support first. Begin by looking forward, not upward or using the wall for support is option.